The team conducts an investigation in a haunted hotel room. Seriously spooky stuff happens to the so-called skeptics. Will they survive the night? 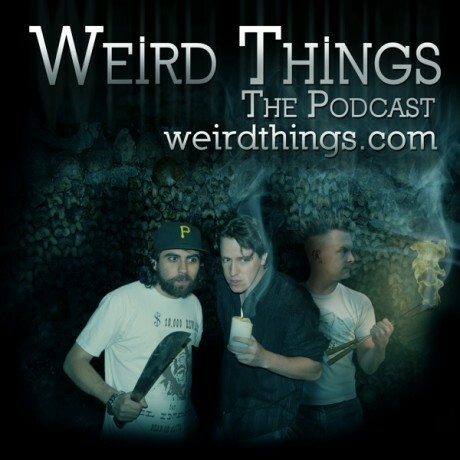 That was the most uncomfortable episode of weird things ever. But I’m a total wuss when it comes to ghosts. I loved it! This American Life did a piece on the history of Ramada (Retlaw) Hotel in Fon du Lac and Walter. This is such an incredibly creepy and powerful episode. One of the best (if not the best) Weird Things episodes ever! I listened to this while running at night on Halloween. I hate you guys for turning me into a total chicken! I loved this episode, especially the parts where Chad and Brian reveal themselves to be scaredy babies. And also the Bible passage was soooooooo creepy! One of the best podcasts so far! Glad I didn’t listen to this one in the dark. Definitely creepy. And hey… I helped sponsor it! This episode rocked! I can’t wait to see the photos and videos. You guys do great work, keep em coming! Btw the hotel review said an outline of a head, thus I’m assuming he meant an indent on the pillow of where a head would be, an then he put his hand on the pillow which was ice cold. I only bring this up because I too thought what Justin thought at first. That was a great podcast. Chad creeped me out when he was talking by himself. I dont know why. I hope to hear another one of these soon. I wonder if the EVPs are going to be posted. looking closely at the white noise pictures, i think ican see something…..
….3/4 is just rubbish but 1/4 looks like cosmic background to me. I am no Bible scholar and I may have seen the exorcist too many times but this sounds very much like a line I have come to associate with the Rite of Exorcism. I think I have heard it as “a strong tower in the face of the enemy”. I am a skeptic but since the event does have an air of spookiness to it I thought I would make sure all aspects of the spookiness were on the table. Thanks. I am loving the show. PS: I loved the EVP from the bathroom. I often say the same thing as Walter in my own bathroom when I eat too many habanero peppers.